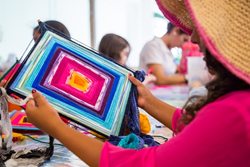 As part of Grand Velas Riviera Maya’s continuous commitment to ensure its guests are acquainted with the ancient history and customs of the Yucatán Peninsula, the Kids Club is launching a new, exciting program that enables children to master the 2,000-year-old tradition of weaving their own dreamcatcher. As part of Grand Velas Riviera Maya’s continuous commitment to ensure its guests are acquainted with the ancient history and customs of the Yucatán Peninsula, the Kids Club is launching a new, exciting program that enables children to master the 2,000-year-old tradition of weaving their own dreamcatcher. Known as the ‘Huichol Eye’ which means ‘The Eye of God’, this ancient craft process has been present for centuries amongst the native populations of the Coras and Huicholes in the Mexican states of Jalisco and Nayarit. For more reservations or more information on Grand Velas Riviera Maya, please email reservations(at)velasresorts(dot)com, call 1-888-407-4869, or visit http://rivieramaya.grandvelas.com/. For more information on Grand Velas Riviera Maya, please visit http://rivieramaya.grandvelas.com/.